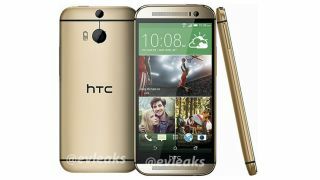 Hot on the heels of the rumour the Taiwanese firm will launch its new smartphone under the title the "All New HTC One" on March 25 comes an image potentially revealing the entire device in a fetching gold hue. Perennial leaker @evleaks is at the heart of things once again, posting the render along with the message "The All New HTC One, 2014" - and the dual-lenses we've been hearing so much about on the rear of the handset are present once again, as is a dual LED flash. There doesn't appear to be any sign of a fingerprint scanner, and while we can see the SIM slot there's no depiction of any potential microSD port - although it could be on the side not shown in the picture. Of course there's no guaranteeing the render is the real deal as they can be quite easily created in editing suites, so let's not get totally carried away just yet. If the leak is legit then the new HTC One doesn't appear to stray too far from the design of 2013's One, which isn't a bad thing as we absolutely loved it. What specs will the all new HTC One 2014 be rocking?